Your monthly target budget and user checkout limit control how much you spend on CPC (Cost Per Circ) content in your digital collection. You can edit your target budget and user checkout limit at any time, and changes will take place within 24 hours. Select CPC monthly budget from the left navigation menu. In the pop-up, enter your monthly target budget for each format. Note: It's possible to exceed your target budget. See this article for more information. When new CPC funds become available (you increase your budget, or a new month starts), holds on CPC content will be filled before new checkouts can occur. The account that originally sets up the budget for a shared collection will be billed for all CPC checkouts. This includes checkouts by any shared collection user and checkouts for CPC titles added by other members of the shared collection. 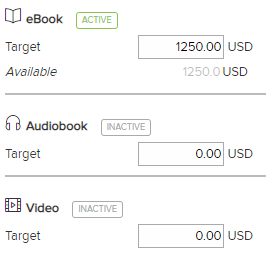 A format is labeled "Active" when your library has added CPC titles in that format, entered a target budget, and set a monthly user checkout limit. You can view a format's available budget for the current month under its target budget. Select Library site admin (or School site admin) from the Admin drop-down. Next to "Limit the number of CPC titles my users can borrow," enter your preferred limit for how many titles per format a user can borrow in a month.